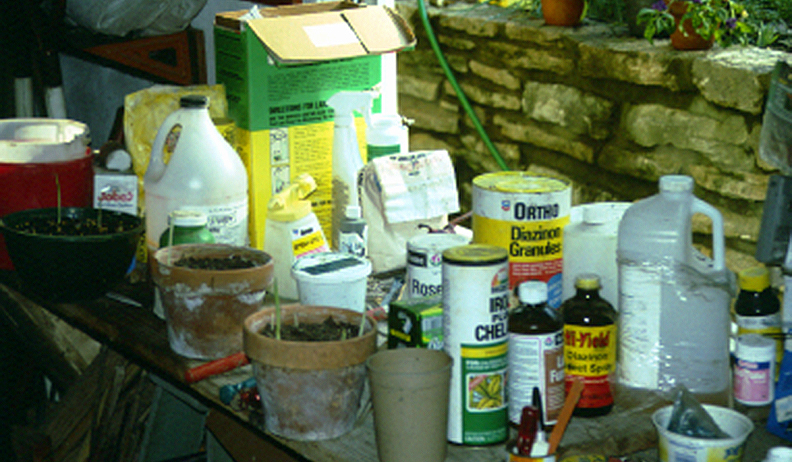 Urban and suburban gardening in its current conventional form is a significant source of chemical pollution. The pesticide collections of the American homeowner comprise one of the largest and most dangerously diverse toxic waste problems our landfills face, and the runoff of lawn and garden treatments into storm sewers, rivers, streams, and lakes is a serious source of water pollution as well. Pesticide contamination is widely considered to be a farm problem, but suburban areas receive up to six times the rate of pesticides per acre as farmland, and while 80 percent of pesticide use in this country is agricultural, the Poison Control Center of Los Angeles reported in 1983 that 97 percent of all pesticide-related inquires came from consumer use. Yet no public records are kept of sales to home gardeners, and the federal program to monitor pesticide poisoning incidents was discontinued in 1981. A paper in the Journal of the American Medical Association a few years back revealed two unsettling discoveries by a team of epidemiologists: first, an American male nonsmoker like myself, born in 1949, is three times more likely to develop cancer than my grandfather, who was born in the 1890s — even with the progress made to improve air quality. Why? According to the study, as reported in the Washington Post, “cancer-causing hazards in addition to smoking have been introduced into the population in the past several decades.” Second, cancer rates among farmers—who are otherwise healthier than the general population—match these increases, but precede them in time, which “suggests that more detailed studies of agricultural exposures might yield important clues about preventable common causes,” to use the cautious language of the medical establishment. To me the meaning of these two findings is clear. Farmers—who embraced the use of agricultural chemicals decades before homeowners—are reaching the end of the latency period that makes it so hard to prove a particular cancer was caused by a particular chemical. And now the majority of the US population is beginning to show the same alarming rise in cancer rates—all because of flashy four-color ads and high-power marketing aimed at the basest human emotional needs: status and pride on the upside, fear and anxiety on the downside.